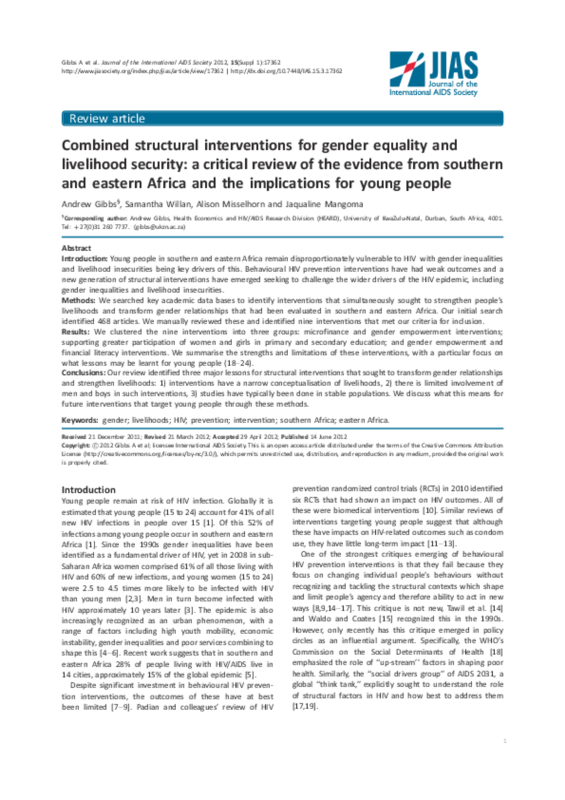 Our review identified three major lessons for structural interventions that sought to transform gender relationships and strengthen livelihoods: 1) interventions have a narrow conceptualisation of livelihoods; 2) there is limited involvement of men and boys in such interventions; 3) studies have typically been done in stable populations. A new generation of HIV prevention interventions has purposefully moved away from narrowly targeting individual's knowledge and attitudes to recognizing how social contexts shape poor health and wellbeing, and attempting to modify these to enable behaviour change that leads to HIV prevention that the broad economic constraints on men and women are linked into wider processes of global change, capitalism and state policies. The interventions reviewed do nothing to challenge these wider issues, which underlie economic inequality. Yet, while challenging these broader processes is critical, such work will take a long time to achieve and at the same time, smaller structural interventions are required to ameliorate the worst impacts of these.